Officials continue their investigation into a fatal accident during the city's Fourth of July parade. Bangor officials, who continued their investigation Friday into the fatal accident at the city’s Fourth of July parade, released the names of the man who was killed and the driver of the antique fire truck that hit him. Wallace L. Fenlason, 63, of Holden was killed around 12:40 p.m. when the 1941 tractor he was driving on Water Street tipped over and he was hit by the city’s oldest fire truck at the intersection with Main Street. The 1930 hose truck, driven by Bangor firefighter Patrick Heathcote, 29, rolled onto the tractor, killing Fenlason. Police said the fire truck’s brakes may have malfunctioned on the downward slope of Water Street but they won’t be sure until the investigation is complete. The parade had been rerouted off a more level road to avoid a police standoff earlier in the day, in which a gunman fired more than 70 shots before being taken into custody. Bangor police said the tractor was making a right turn onto Water Street when it was hit from behind by the vintage fire truck. Witnesses said the tractor tipped over, spilling Fenlason onto the road and into the path of the truck. Several people in the crowd came forward to help the driver, but had to retreat because the fire truck was coming at them. People in the crowd pushed the fire truck up the hill and off Fenlason, but he did not survive. The fire truck is one of three held by the Hose 5 Fire Museum, a volunteer group that works to preserve and promote the city’s firefighting history. The group is largely composed of retired firefighters but includes some younger members who are active in the fire department. Heathcote, who lives in Levant, is apparently a history buff, said Rick Brooks, a retired captain who is a member of the Hose 5 Fire Museum. “Patrick is a great guy with two nice kids that were on the back of the truck,” said Brooks, who said he had asked Heathcote to drive the antique pumper. Brooks said the alteration of the parade route may have contributed to the crash. He referred questions about the truck’s maintenance to the city attorney. Assistant City Manager Robert Farrar said he did not know the registration or inspection requirements for antique fire trucks. He had the Finance Department check city records but found no record of the truck being registered with the city, though it may have been registered directly with the state, he said. A message left with the Department of Public Safety’s vehicle inspection division was not returned Friday. Bob Morris, president of the Maine Vintage Race Car Association, said antique vehicles must be registered and inspected if they are taken out on the road. The inspection does not require equipment that was not on the original vehicle, such as turn signals for cars that predate the feature, but safety features such as brakes must be in good shape. Brooks said the fire truck was manufactured by the McCann Fire Truck Co. in Portland and purchased by the city of Bangor when it was built. “It’s still a city of Bangor vehicle,” he said. The accident is being investigated by Bangor police Officer Jim Dearing and members of the evidence response team, with assistance from a Maine State Police accident reconstructionist. Heathcote has no accidents or violations on his driving record, according to the Maine Bureau of Motor Vehicles. He did not return messages left at his house Friday. Police ask anyone who saw the accident or has video of it to contact Detective Cliff Worcester at 947-7382. 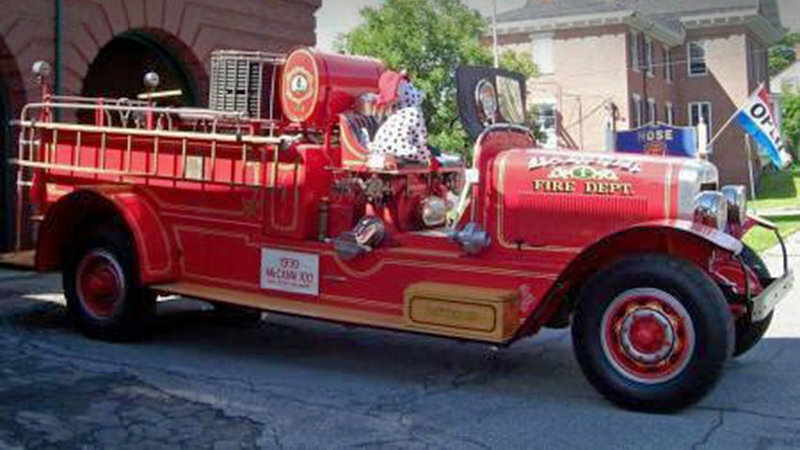 Bernard Fishman, museum director for the Maine Historical Society, said antique fire trucks are popular at parades. “There are things that are valuable historically behind layers of glass, but if you see a machine moving or ride on an old train or participate in a re-enactment, you’re getting closer to the history,” he said.